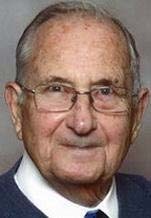 Jack Ainsworth, age 84, died Saturday, September 15, 2012, at his home in Cedar Falls. He was born November 27, 1927 to Raymond and Hazel (Seeley) Ainsworth. He graduated from Waterloo West High School in 1946. He married Dana (Rowden) on January 26, 1952 in Gladbrook, Iowa. Jack was employed by John Deere, retiring in 1981. He was a member of the McDonalds Breakfast Club. Survived by his wife, Dana; five daughters: Jaci (Bill) Hunt, Sue (Dean) Miller, Jill (Tom) Murphy, Mary (John) Syndergaard, Dana Jo (Rex) Davis; one son, Ray (Karla) Ainsworth. One sister, Pat Kennedy, and also 15 grandchildren, 14 great-grandchildren, and one great-great grandchild. Preceded in death by his parents, and one sister, Jeanne Gott. Services: 11am Tuesday, September 18, at Living Water Church of the Nazarene, 1210 W. Lone Tree Rd. in Cedar Falls. Visitation one hour prior to service at church. Burial at Hillside Cemetery, with military honors provided by the Cedar Falls AMVETS post #49. In lieu of flowers, memorials may be directed to Cedar Valley Hospice, or to the church.